I made the mistake of seeing this at 4pm on a day when the school's were on vacation (I sneaked out of work early). I got there during the previews and even my big theater was nearly packed. So I ended up sitting next to a 4-year-old and a toddler on the other side. If I hadn't just paid $10 I would have left out of fear of what was coming. But I stuck around based on Ryan's review figuring I would probably like it. He was right, I did. The basic story of "Snow White and the Seven Dwarfs" is maintained - Snow White is born, her mother dies, her father marries an evil Stepmother/Wicked queen. Father dies/disappears and the Queen plots to rid the kingdom of Snow White's beauty, because the Queen wants to be the "fairest one of all" according to her magic mirror on the wall. Snow White is sent to the woods to die but meets the seven dwarfs who take her in. And of course, eventually, Snow gets her kingdom back and true love's kiss helps save the day. However, Mirror Mirror does a good job of removing a lot of the cliches (Prince Charming saving the day) and some of the bigotry/misogyny. Snow White (Lily Collins, much less annoying than she was as a child actor on Gilmore Girls) has been hidden away from her father's kingdom as the Queen (Julia Roberts attempting to break typecasting) bankrupts the coffers for her lavish lifestyle. A helpful maid (Mare Winningham) encourages Snow to leave the castle and see the kingdom. She does and is appalled by the state of her people. On her way home Snow comes across two men in their skivvies hung by their feet from a tree. 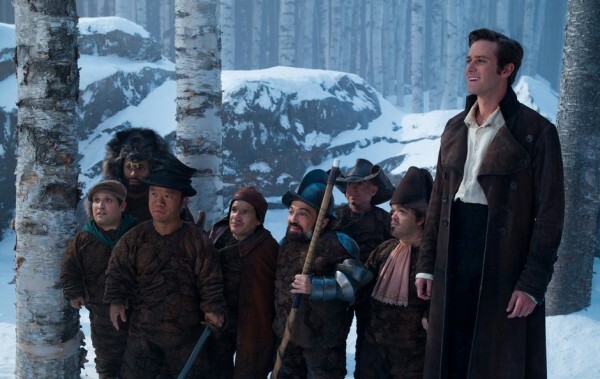 It is Prince Alcott (Armie Hammer) and his squire. They were set upon by bandits (the seven dwarfs) and brought back to the Castle by Snow. The Queen realizes that Alcott can solve her financial problems if they marry, so she goes about trying to seduce him. Of course, Snow and Alcott are already smitten. You know what's going to happen with the rest of it, though the beauty of every scene is totally worth watching - it's GORGEOUS! So instead I'll mention how clever they were with the dwarfs. Played by 7 short men, almost all recognizable from other roles, particularly Danny Woodburn from "Seinfeld" and Martin Klebba from the Pirates of the Caribbean franchise. They don't have the classic Disney names, but instead more personalized names like Wolf (he wears a wolfskin and howls), Napoleon (he wears the hat and has a gift with hair and makeup), and Chuckles (who smiles and giggles all the time). They are bandits, having been banished from the town by a decree of the Queen. They have amazing stilts that extend at will and their acrobatics are impressive fight choreography all around. Played for ferocity and laughs, it's a terrific gimmick that works even in repetition. Snow convinces them that they can't steal anymore, and in turn for cooking and cleaning for them, they teach her how to fight (a remarkably short montage for a kids' movie). Napoleon approves her new look (she arrives at their place in a ballgown) and she ends up looking a bit like a wench or pirate, but it works. Overall, the creativity with a well known story is impressive. 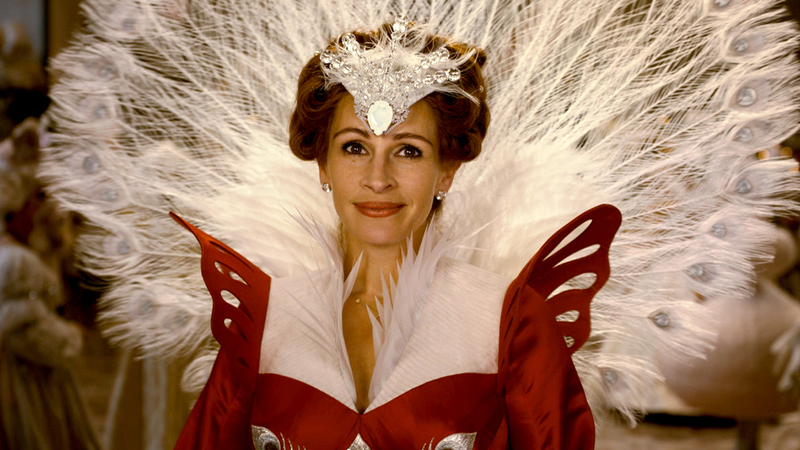 I liked Julia Roberts as the Queen. I think she plays narcissism particularly well. However, the "mirror mirror" part was an ineffective gimmick. She walks through the mirror and arrives in another world (why was it thatched huts in the ocean? I didn't get that) where she talks to her young, beautiful self in the mirror. The mirror has magical powers and the Queen demands those powers be used to kill Snow White. The dialogue from the mirror was weak and Roberts' acting as the person in the mirror was bizarre. As the Queen, I thought she was great. But a small price for a pretty good older kid movie. The 4 year old boy sitting next to me howled with "Wolf" and loved the sword play between Snow and Alcott. The little girl behind me swooned ("Ahhh") when they married. So effective all around. "Why was it thatched huts in the ocean?" Because it's a Tarsem movie...and he always needs to put his surrealist visual stamp on his films. *Great* review by the way - really highlights what made the movie for you. Thanks! Still don't know who Tarsem is, but I'll check him out.